Barley wine | Beer Blotter: Seattle based. World focused. It’s that time again. Are you ready for barleywine season? Ready or not, here it comes. Starting this Friday the 25th, West Seattle’s finest beer emporium, Beveridge Place Pub (6413 California Avenue Southwest) hosts it’s 9th (I think) annual festival of all things barleywine. 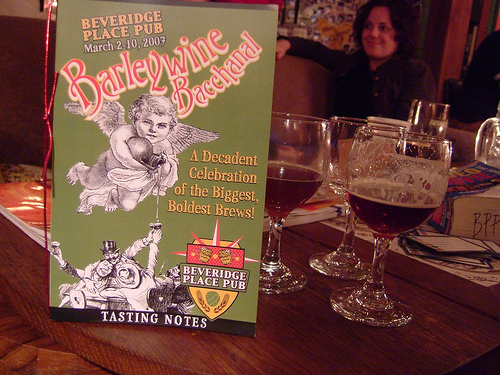 FEB 25 – MAR 5, 2011: Barleywine Bacchanal! A Decadent Celebration of the Biggest, Boldest brews! 50 rotating barleywines on draught from the West Coast’s best breweries including many new releases as well as vintages from the cellar! 24 dedicated Barleywine Taps throughout the Fest! Look for upcoming information regarding special tasting events during the Bacchanal. In case you’ve never been to this festival before, this is how it works, or at least how it has worked in the past… BPP will post a schedule of what beers they plan to tap on each day of the fest. This is very unlike the way Brouwer’s does their Hard Liver Fest (March 12 – 16). As it says above, BPP doesn’t tap all of the b-wines at once. Each day they will have 24 on tap and shuffle through the entire collection as kegs blow/days go by. This has the potential to remove some of the weight off of your shoulders when it comes to attempting to get all of the rare offerings at once, but it could also mean that you will need to go to the pub on several occasions to get everything that you want. We will try to keep you abreast of the schedule as it becomes available so that you can work out your game plan. Obviously, we have yet to see the list for this year but one could reasonably assume that some, if not all, of the following standards will be available. ***Firestone Walker Abacus*** – If we are really lucky.